As you all know, Neat & Tangled design team member Amy Tsuruta runs several Coffee Lovers Blog Hops throughout the year and the Fall Coffee Lovers Blog Hop is on now through Friday! 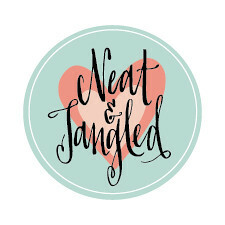 Neat & Tangled is a Super Sponsor and there are many prizes to be won so I hope you'll join us! I combined four different sets to create my card. I watercoloured the Hooray Die, as well as the coffee mugs from Perfect Blend, using Gansai paints. The background was created using the Graduated Stripes Cover Plate, backed with patterned paper from Crate Paper's Cute Girl 6x6 paper pad. I added to the sentiment with a partial from Big Top Birthday. To finish, I attached a white hemp cord bow and tiny pearls to the wreath. Such a beautiful card! Thanks again for being a sponsor!! Very cool card. Love that cover die. Such a great card Emily. I have ONE coffee set and I won it from N&T this past year. Thank You! I don't yet understand how this particular hop works and I don't have a blog so, right now I am just enjoying what I see...Thanks for being a sponsor though! Love the background and the wreath. 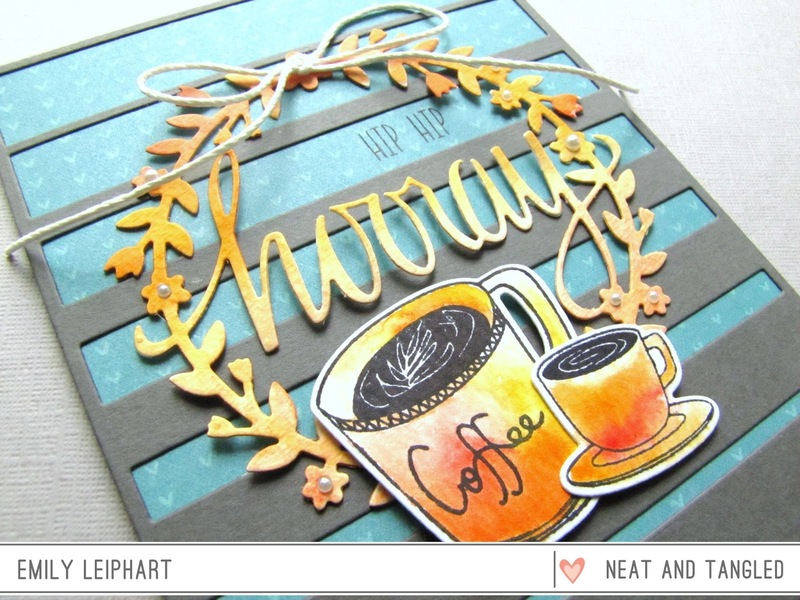 I don't like coffee but I love this card! The wreath coming down and around to "point" to the coffee mug/cup is perfect. I love the die you used in the background and might just have to go over and purchase it very soon! Thanks fo sharing. 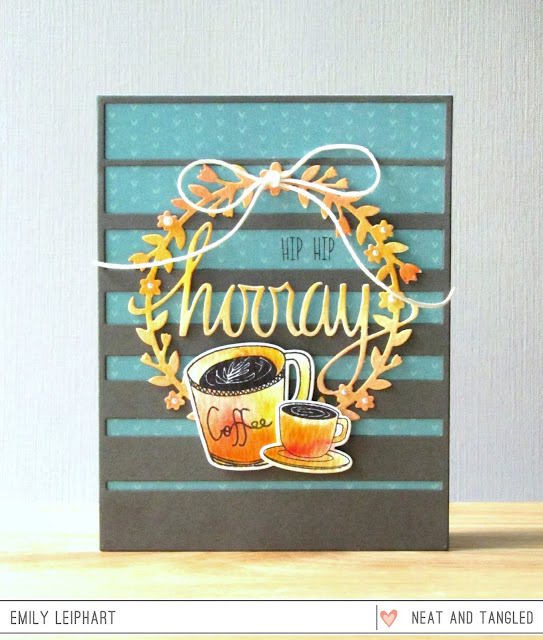 LOVE your colour combo and design!!! 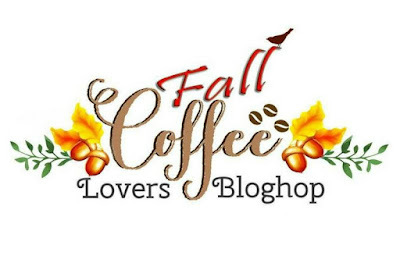 THANK YOU for sharing your caffeinated inspiration!!! Sending a big THANK YOU to Danielle for being a SUPER SPONSOR too!!! I love your card! 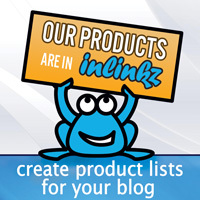 Thanks for sharing your ideas!